Today was the tutorials day at NTD, and what a lovely start for a conference it was. Choosing a tutorial was really difficult (so I'm glad I've done that part when registering) - with the exception of "java for testers" that claims to cover stuff I already know, I simply couldn't tell which one I prefer going to. By the end, I chose Fiona Charles's workshop on heuristics. It started out really well, with a short overview of what heuristics are - and I do prefer her way of looking at it as "shortcuts" instead of the overly wide "fallible methods of solving a problem", since it narrows the field at least a bit. My main difficulty with "heuristics" is that it can be used to describe just about anything people do, and using "shortcuts" narrows the field of discussion to useful heuristics and enables some sort of a meaningful discussion about it. Before lunch, we played some children games, and tasked with the goal of finding some heuristics to solve the puzzles and track our heuristics as they changed over the exercise. What really got me was that none of the initial heuristics we tried to apply first held true, and soon after starting to actually solve the puzzle. Doing something only because it seemed to make sense in the past is not necessarily a good idea. The cool thing in this, though, is that heuristics that are not helpful were als really hard to follow for a longer period of time. The second part of the workshop started by watching this video and being asked "what heuristics would be useful for testing this, if all the information that you have is this video?" Well, that was tougher than I thought it should be. Armed with the (tacit) knowledge that coming up with heuristics before actually doing some of the work would not necessarily be productive, we got to the task of coming up with test ideas and filling the information gaps we had with assumptions. After doing that for a while, we've tried grouping the test ideas to similar categories in hope of distilling it to a point where it would be easier to notice some of the heuristics we were using - that didn't go as well as I thought it would, since we found ourselves looking at a checklist (which is a great heuristic by itself), and not really knowing what was leading us. In the latest 3 minutes or so of the exercise something clicked and we were able to detach ourselves enough from test-idea generation, and look at how we were doing that. Our main heuristic to generate ideas was using scenarios (or use-cases, if you would prefer), which had a lot to with personas (the phrase "redneck with a crowbar" did come up once or twice). I could totally see how naming those heuristics could help me get a better coverage given some more time, but as it usually is in workshops - time is of the essence. 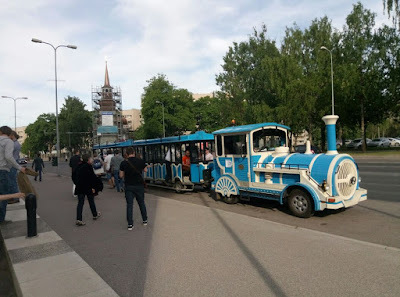 The day ended with speaker's dinner, which started in the cute train you can see at the top. quite a nice way to get to where we wanted - it started with a toast on some sort of a balcony, overseeing the beautiful Tallinn, followed by a medieval-themed dinner (in a dark, candle-lit restaurant), after which we were dragged to a bar to try out something called millimalikas (or something of the sort, I heard it means "jellyfish" is Estonian, but did not verify that), which is two sorts of alcohol, one of which is anise-based (read: really disgusting) and some tabasco to make it painful. Thankfully, the tabasco burn did eradicate the anise after-taste, but it is definitely not something I would repeat. All in all, a packed day, which was a prequel to an even more packed conference.